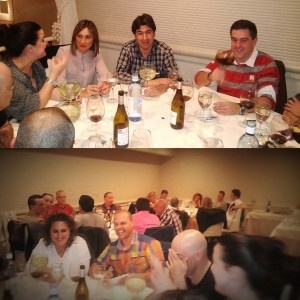 The team that integrate E&M Combustion celebrated last December, 18th, Christmas dinner in the restaurant Zuria Bilbao. At the company dinner 17 people participated. The rest of our colleagues couldn´t attend the meeting because they were working in technical assistance, which were working outside Spain , and colleagues of our offices in China and Portugal. We had the chance to enjoy a great dinner service. As an anecdote , at the closer table he was having dinner Athletic player Laporte. After dinner , we continued chatting and having something in the area of Mazarredo .